My daughter's been 12 for less than a week, and already she's changing. 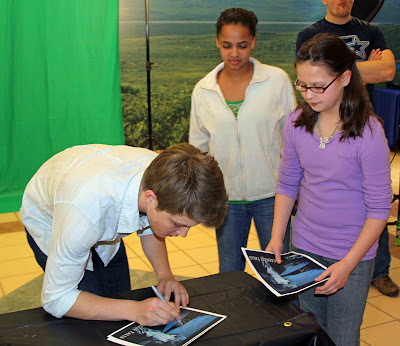 After never expressing the tiniest interest in boys, she asked me this past weekend to take her to the mall so that she could meet Sterling Knight. If you're like me, you're thinking, "Sterling who?" Even though we don't receive cable TV, she knows that he is a popular Disney actor and singer, and took a deep breath to calm her nerves before explaining this well-known fact to her clueless mother. Obviously, if I have never heard of this young man then he is not famous. Sonny With a Chance? Please. Now, Lawrence Welk re-runs on PBS . . . there's some talent for you. I'll bet you any money this Sterling kid can't play an accordian, tap dance, and sing at the same time. Grandpa? Is that you? Next I'll be lecturing my daughter that she should be listening to a real singer like Perry Como, instead of that hippie named Elvis. I may be a pop culture ignoramus, but I'm also a big sucker, so my girl succeeded in convincing me to drive her to the mall so she could say hi to this Knight character. She assured me she would use her very own birthday money to pay for his autograph and picture, but I had to promise to take her 45 minutes early in case there was a line. Her instincts were correct. At least 150 restless adolescents were already waiting, and the line that quickly piled up behind my daughter was UNbelievable. Maybe this guy IS popular. 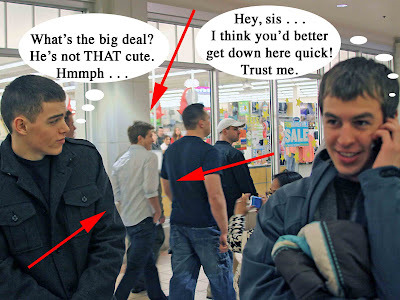 I left my daughter in line with a couple of friends who had also shown up, and went shopping for awhile. 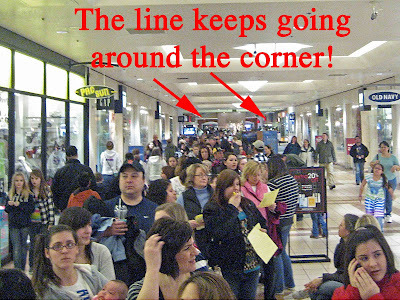 Just as I was returning to the meet-and-greet area, I heard a murmuring from the back of the line . . . the rumbling grew and grew in volume, then morphed in pitch, until it was a cacophony of screams and laughter. Here he comes! I was ready to take a picture. The only problem? I have no idea what he looks like, so I just started snapping pictures of the entourage and hoped he was in there somewhere. Later, when we reviewed my shots, I found just one picture in which you can actually see the person I was supposed to be photographing. I was greatly amused watching shoppers who just happened to be passing by with no clue as to what was going on. Reactions ranged from "This must be the line to the restroom" to "OMG! It's Sterling Knight!!" *thud* as they fainted to the floor. My daughter asked me in all seriousness if she should try to get his phone number; I kept a straight face as I told her that this event was more like a job for him and he probably wouldn't be giving out his "digits" to strangers, even those as beautiful and charming as she. She nodded, "You're right, Mom. He'd probably give me the number of his agent." The future Mrs. Sterling Knight. He is quite sterling isn't he? At least he isn't platinum! I only know who that is because of Radio Disney in Indianapolis and his interview was hilarious. Am I lame because I have absolutely NO clue who he is?? Although I can see why your daughter likes him, he is rather adorable...you know, if you're a total cougar and into that kind of thing. The picture of your daughter with him is awesome...is she gonna blow it up and frame it for her room? i am so behind the times, i have no idea who he is! and i smiled from ear to ear when i read that she asked you if she should try to get his number...that is by far the sweetest thing i've ever heard. she is absolutely darling.